Systems Thinking does not really have a process as such. It is much more an approach or methodology, two of which, the Systems Approach and the Hard Systems Approach are commonly cited. At Burge Hughes Walsh we have developed a third approach based on our experience in applying the hard and soft approaches. We have developed the Unified Systems Approach, which is a framework for doing Systems Thinking rather than a step-by-step process. 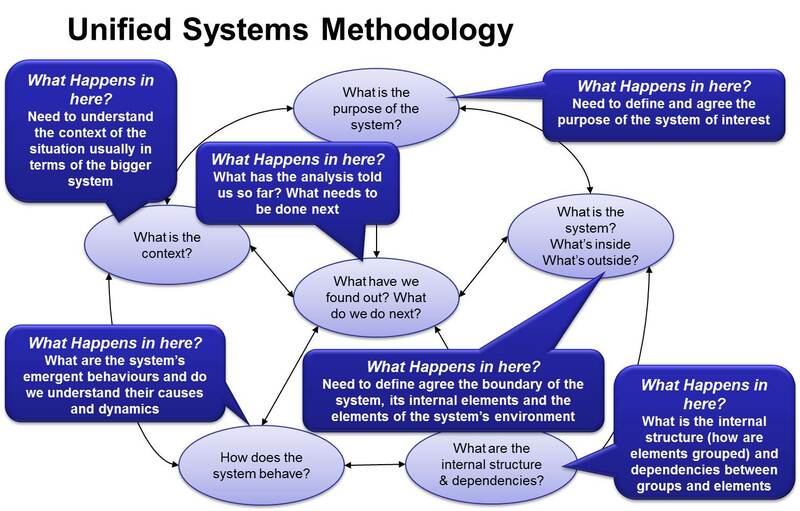 This framework organises our thinking to consider all the characteristics of a system relative to the situation we are investigating, and by doing so find out more about the particular situation. The Unified Systems Approach is based around answering a number of questions about the situation (system) of interest combined with a set of tools to assist.